Many people can still function with a biceps tendon tear, and only need simple treatments to relieve symptoms. Some people require surgery to repair the torn tendon. Your shoulder is a ball-and-socket joint made up of three bones: your upper arm bone (humerus), your shoulder blade (scapula), and your collarbone (clavicle). In many cases, torn tendons begin by fraying. As the damage progresses, the tendon can completely tear, sometimes with lifting a heavy object. 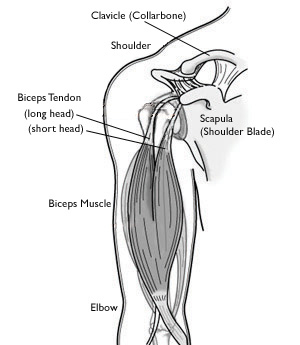 The long head of the biceps tendon is more likely to be injured. This is because it is vulnerable as it travels through the shoulder joint to its attachment point in the socket. Fortunately, the biceps has two attachments at the shoulder. The short head of the biceps rarely tears. Because of this second attachment, many people can still use their biceps even after a complete tear of the long head. When you tear your biceps tendon, you can also damage other parts of your shoulder, such as the rotator cuff tendons. Overuse can cause a range of shoulder problems, including biceps tendonitis, shoulder impingement, and rotator cuff injuries. Having any of these conditions puts more stress on the biceps tendon, making it more likely to weaken or tear. > Because a torn tendon can no longer keep the biceps muscle tight, a bulge in the upper arm above the elbow (“Popeye Muscle”) may appear, with a dent closer to the shoulder. Partial biceps tendon ruptures are less obvious. To diagnose a partial tear, your doctor may ask you to bend your arm and tighten the biceps muscle. Pain when you use your biceps muscle may mean there is a partial tear. Surgical treatment for a long head of the biceps tendon tear is rarely needed. However, some patients who require complete recovery of strength, such as athletes or manual laborers, may require surgery. Surgery may also be the right option for those with partial tears whose symptoms are not relieved with nonsurgical treatment.